The administrator of a Venice church is accused of embezzling more than $50,000 intended to help struggling parishioners, the Sarasota County Sheriff’s Office reported. Robert Kondratick, 67, of the 11700 block of Tempest Harbor Loop in Venice, was arrested Wednesday, accused of embezzling church funds intended to help people who have fallen on hard times. In January, church council members contacted the sheriff’s office after discovering funds had been misused over a six-month period from June to December 2012. Kondratick, then employed as administrator of the Holy Spirit Orthodox Church, 700 Shamrock Blvd., was fired by church officials. 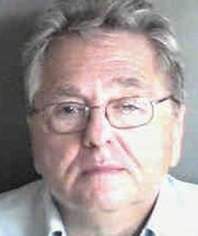 Church leaders told the sheriff’s office that Kondratick requested signed blank checks to pay what he claimed were church expenses. But an investigation revealed he cashed 28 checks made out to “cash” or to himself — totaling $53,950. The report added that Kondratick was paid a salary of $3,673 monthly and also given $811.41 per month for medical insurance and automobile reimbursement. Detectives obtained an arrest warrant for Kondratick, who turned himself in to face one felony count of grand theft. Barbara Demis, church council warden, learned of the arrest Wednesday afternoon. It appears that this is not the first time Kondratick has been accused of stealing from a church, the police report. In 2007, the Orthodox Church of America in Syosset, N.Y.,relieved Kondratick of his duties as priest following an investigation into financial misconduct. No criminal charges were filed, but the police report said Kondratick was tried by church leaders in a “Spiritual Court,” after which he was removed as a priest. The Holy Spirit Orthodox Church of Venice was formed in 1984. The church moved into its parish at 700 Shamrock Blvd. in 1991.